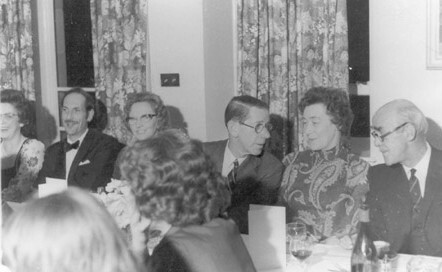 The retirement dinner held in 1975 for Mr. Milton and Mr. Cooney. Mr Cooney taught French and German in, I think, room 17 in the building that's now the library. That's him 3rd from right isn't it? G Milton extreme right. Second on left is Russell Preston, who taught Geography. Mr Cooney belted me on my first day in his class (I deserved it!). Oh how I regret not taking French more seriously - I am still struggling to learn the language of, what has become for me, a beloved country. Anybody remember King Kong, Mr McIver if my memory serves me right? He was in the same room that Mr Preston taught in, and I think he lived at the same address in Gordon Terrace as well. King Kong rings a bell, Gordie, but I have no clear memory of him but as I lived in Gordon Terrace I must have known him, what did he teach? Returning to Mr Coonie and having another look at him, it is astonishing as to how FRENCH he looks! Surely he must have origins in France but I cannot remember him talking about the country in a way which would stimulate a child's interest......a shame really, as I am sure he was very dedicated to his job. King Kong definitely lived in Gordon Terrace (No. 27) and was replaced there by Mr Preston. Apart from Mr Cooney and Johnny Ross (Leeky), Gordon Terrace also housed Bill Smith (Technical) and Mr & Mrs Donald MacFarlane (Lofty and Tich). Yes Gordie, I remember King Kong, huge..when I was in school he taught in the building where the carpentry shop was, east of the canteen..Gordie if you are Brenda's brother, say hello to her and Willie for me will you? Hi Bill, King Kong taught History, in the same building as Bill Smith. He was a big man, I think you must remember him racing down Gordon Terrace on his bicycle. He lived next door to Tubby. He was an accomplished speaker and was in great demand for Burns suppers. Hi Roddy, Mr & Mrs MacFarlane never stayed in Gordon Terrace. They stayed up the back in Scotsburn. The Cooneys stayed next to the Smiths, and at the other end Tubby Mathieson stayed next to King Kong. Johnnie Leekie stayed across the road in one of the wooden houses - I remember this as I delivered the sunday papers for about 4 years. With all those teachers in the street we should all have turned out as geniuses! Still can't remember King Kong. I did not realise they had teachers for different academic "streams". I guess this is why I have no recall as I can certainly remember Tubby. I once passed him on the street and I said "aye aye" which was a bit cheeky and familiar. He gave me a telling off in class the next day but I could tell he was having trouble not laughing! My first clue that teachers were human! The Macfarlanes lived in Gordon Terrace before they moved to Scotsburn, Gordie. It was I think at about No. 8 or 10, possibly, where the Kemps moved into. My family were one of the originals in GT, moving in in early 1950 before the odd Nos were built, when I was just a toddler. I can remember many of the secondary school teachers mentioned here eg 'Ma and Pa Conon', Mr Cooney, Mr Preston, Mr Milton (Rector), Mr and Mrs McFarlane, Mrs Auchterlonie (Mrs McFarlane's twin), Mr Smith. However - who remembers the dashing Mr Stewart, the music teacher? - or the cookery teacher, Miss Macrae? It was great reading all these comments about our former teachers. Johnny Leekie, Tubby Matheson, Mr. Cooney (did he ever have a nickname) and I very rarely saw him smile. Does anyone remember Miss Campbell, the art teacher ("If you've got a seat, SIT DOWN"). Lofty and Tich Macfarlane and his sarcastic but funny comments!!! Weren't they all "key workers" so they automatically got houses? Gordie, can you also say hello to Brenda and Willie from me? No, I can't remember Mr. Cooney having a nickname. This is odd as it was a very common thing and of course Mr. Cooney had a feature which was just begging to be used for a nickname. Perhaps kids were too scared of him to risk it - or maybe he was secretly respected beyond the norm because of his clear dedication to his job. I still regret sniggering instead of paying attention! I guess "Cooney" was nickname enough for him.....no-one has mentioned Miss Carmichael who taught out of room 15. Very prim and proper and walked like her legs were welded together at the knees.....Lizzie? Katie Carmichael, I think, Harry. Towards the end of her career I fear she became increasingly reliant on the juniper berry. Harry, Miss Carmichael was Katy not Lizzie, she taught us Science, if I remember, and she also taught Maths in room 15. I think she stayed in Tain. Harry, Miss Carmichael was known as Katy, not Lizzie. Heather, the "dashing Mr Stewart" is still dashing about making music all around. Miss Mackintosh the Primary Three teacher whose catch phrase was "I'll murder you boy!" - a wonderful start to the world of education. Milton the Rector, seldom seen without hands in pockets, dishing out sarcasm by the barrowload. Turnbull the gym teacher, always reeking of Capstan Full Strength. Addison the Maths teacher who followed Tubby, gravel rash and keekers a regular feature as he misjudged the path between The Com' and his digs. Miss Sutherland, who knew it was a school pencil because she had inscribed the letter S on it in Hindi, clever eh? Remember Sabrina too? Why did they call her that? Jackie Hall who did his utmost to make science boring. Invergordon Academy, what a dreadful place it was. Not forgetting the confidence building Dr Stewart science teacher, who told us, the whole class if not the whole school, that we were a bunch of "no hopers" and had little chance of any success in the world after an education at Invergordon Academy. He himself was just passing through on his way to become Director of Education for the County. I do not remember a 'Sabrina' but could it be that she was rather well-endowed as was the 'starlet' in the '50s with the same name?! Mr Stewart still making music! Good to hear it! I would have thought he was well past retiring age by now? Gord, do you remember the Rector Clark "The Jake"? There is a pic of him on the site. Well I remember "The Jake", he had an office like a broom cupboard at the top of the stairs, which he shared with Ena Gordon. If my memory serves me right it had no window, and always seemed dim and miserable. Sabrina, or Miss MacKenzie's room was out next to King Kong, and if things got a bit boisterous, he used to come through and sort us all out. Happy days. I remember Ena Gordon - school secretary? Ena was also my Guide Captain. I had a lot of respect for her. When did she retire? Harry and others - Yes, Miss Campbell did teach upstairs and Yes, she used to hang out of the window. Why were we so reluctant to go to her class.?? Who could forget Katie Carmichael? As for The Jake, I think that I was the only girl who got the strap from him (not deserved). I had red marks on my wrist for a few days where the strap wound around. Harry, he would never got away with that now. I wouldn't have mentioned it at home for fear of getting a telling off!! Ena Gordon left her job as School Secretary in middle age and studied successfully for a degree and became a Secondary School Teacher at Alness Academy teaching English and History I think. Sadly Ena passed away a year or two ago - she was a wonderfull character who touched many lives in all her various activities and interests. Graham - thank you for the information about Ena Gordon. I was sad to hear she had passed away. Yes - she certainly touched my life all thse years ago as my Guide Captain, which I have never forgotten. Can someone fill me in on Katie Carmichael? Was she the Science teacher? So far on this pic no-one has mentioned Miss Horne!! So I claim bragging rights for being the first person to mention how horrible she was. Dare anyone say they liked her? How could a Physical Education teacher get away with never demonstrating a single technique. I nominate her as the Number One worst teacher of the '40s and '50s. Bill - I remember Miss Horne well! Wasn't 'navy blue' her colour?!!! Billy, Katie "taught" history in the room next to Tich along from the canteen. I remember her hurling the wooden blackboard rubber across the room and catching some poor innocent on the forehead. She was certainly a rival for Miss Horne for uselessness ....I can never remember any history, but I can remember the steps of the Cumberland Reel, pranced out to that windy-up gramophone of hers! Most of the comments here about our teachers are very negative. I have some very fond memories of some of them, even Battleaxe threatening murder. Who could forget Miss Chrystall elastoplasting an old penny onto a bump on your forehead if you fell, even if it is well over 50 years ago. I remember the incident that Rod mentions, when Katie threw the wooden blackboard duster at Alistair McKay, Tarbert, Kildary, striking him on the forehead and resulting in a cut. Sadly Alistair, who ran his own contracting business was killed at the roadside at Kildary, when he was struck by a truck, as he went about his business. Saddened to hear about Alastair Mackay - when did this happen? I remember many visits to 'Jock Mackay's' emporium at Tarbat - like Steptoe's yard, but what a range of goods! Also remember the results of Mr Addison's (Daddy Addy? )collision with a glass door at Inverness station. It has been a strange and thought provoking journey back to the past reading all these remarks over the last few weeks. I remember the headmaster, Mr Milton very well. Someone mentioned his sarcasm, which I would definitely agree he had no worries about running out of. Personally what I remember most about him was his Chewbacca type eyebrows, which were a definite fire hazard. I also remember a Mr Taylor who looked like Terry Thomas and taught Physics I think, he was a gentleman. I am not sure if the Mr Donald Stewart who taught Modern Studies is the same Dr Stewart mentioned in one of the remarks or not, but it sounds like him. The other teachers I remember with a mixture of fondness and total terror are Mr Shearer the Arts teacher, Ma Baird, English, lived up Ardross I think. Ma and Pa Preston and Connon, Jock Watt, who I always thought should have been a SAS trainer rather than making us poor bairns run all over the golf course in the bucketing rain. I never had the privilege of being taught by Mr Cooney, but since he always reminded me of a Gestapo interrogator I think I am quite glad. It was a different world in school then, not sure for the better or worse, but definitely different. Maybe would have picked other teachers but couldn’t have had better school mates. Often thought if I didn’t leave school when I did, would have had hands like two massive red flippers with that damned belt. Oh what happy memories. Mr Cooney was actually involved in the interrogation of Germans during the war. I wonder if he had the belt in his drawer then! Oh! The memories! Miss Horne.....Bill, I don't think she ever demonstrated anything except for the "Cumberland Reel". How I hated it and when it came to the school dance she picked our partners for us, and definitely not the ones we would have chosen for ourselves. Although a lot of the comments are negative, Rod, and you are right, we did have some wonderful teachers, but it's so good to reminisce. Strange, isn't it that the horrible teachers are the ones that most readily spring to mind. Happy memories though and we're still here to tell the tale!!! Rosalie, correct you are...I watch the kids today running happily to school and not wanting to leave. I don't know about you but it was the opposite for me, used to not want to go but ran like hell at 4pm....The only thing the strap was good for was to warm up your hands in winter....but there was also the ruler across the knuckles, and in woodwork a block of wood at the back of your napper...and like you said you never said a word about it at home lest you got another there.. I think Miss Horne was Mrs Sangster when I had her, black thin frizzy hair, all in black, crepe bandage under black hose and a walking stick. And when we got a new young PE teacher it was amazing, Mrs Laing I think it was, married to the history teacher - and then Mrs Macrae when we moved up to the new Academy. We didn’t like the new school at first as we used to take our time between the various buildings and had shorter classes, but always hurried for Pa Connons in the huts. Enjoyed reading all the comments on here (only just discovered it!). Does anyone remember Miss Holmes - she taught French(?) in a room behind Russell Preston, sadly now no longer with us. I must admit I enjoyed his geography lessons. He was a stalwart in the TA for many years. How well I remember Miss Horne - did she not stay at the Temperance Hotel where the vet's place is now? Any prizes I won for athletics were in spite of her input and not because of it! Seeing so many familiar names of former classmates bring the memories flooding back. Yes Anne, I remember Miss Holmes very well - I had her for French in 1963/1964. It's funny, I didn't apply myself all that well in French classes and now I find myself with a young grandaughter being brought up in France with the native tongue being her first language. Thank goodness she is very adept at English as well, otherwise I would be in a bit of a bind on the communication front. However, I do try and am actually considering taking French lessons. Poor old Mrs Holmes, I wish I had co-operated much more with her. I remember Johnny Ross (Leekie) as our Latin teacher and I was thrown out of class for slinging the blackboard rubber back at him after he tossed it at me. I never returned to Latin but must have learnt something as I managed to pick up the Spanish lingo fairly easily when posted there in the RAF. Mr Stewart (music) was also known as "Daisy". I never found out why it was Johnny Leekie. I really liked Johnny Leekie although I was not very good at Latin!!!! He had a leek carved on his walking stick although I don't think that was the reason he was called that!!! I seem to remember that the Leekie nickname had some connection with the famous Archaeologist family the "Leakeys". (They did groundbreaking discoveries in the Great Rift valley in Africa.) Seems a bit of a long shot as I have never been able to work out the connection! Johnny Leekie also had a reputation as a bit of a "leftie". This was perhaps reflected in one of his sons (David I think) who was something important in the Labour Party. Billy, both of Johnny Ross's (Leekie) sons were (and still are) lively lefties. John, the elder, was a Glasgow Councillor for many years but has now stepped down - I see him and hear of him from time to time. Donald had a successful career in journalism, including the Scotsman and Scotland on Sunday. Sister Isabel is, I believe, in New Zealand. A nice family, despite my memories of being picked up by the hair for getting my Latin grammar wrong! I always thought the nickname came from his own father being a champion leek grower in Balintore. I remember Mr Ross coming to wish my dad a happy new year, I think I was about 10yrs old. My mother said 'oh here's Johnny Leekie coming', so in he comes - my dad said a happy new year Mr. Leekie - I near fell off the pouffe. I think dad was still half p***ed - anyway Mr. Ross never batted an eyelid. No matter what we thought of Invergordon Academy, we must have listened to some of it. I managed to get a degree through the Open University a few years later. Have to agree with you there Rossy, most that I have spoken to seem to have done well since leaving. I don't think many of our class-mates remained in Invergordon though. Reading this again reminded me that Jock Watt won a TV talent competition in the early sixties. One of Ma Baird's children was Alison, now a doctor who I last heard of during the Falkland Islands war when she was tending to injured on both sides, if I remember correctly. Ma Baird's husband was with the Forestry Commission at Ardross and they moved to Gartly near Huntly soon after I left school. Ross, whatever the memories of the Academy, we all seemed to enjoy being there and the good and bad memories are all part and parcel of it. I became a teacher in later years although I left the school at the age of 15 years so good influences are always there. So many of us used to get certificates for perfect attendance so that can't be bad (or was there nowhere to hide if we skived off?). I am proud to be an Invergordonian and of attending Invergordon Academy. Oh my goodness! Just discovered this on a wet and dreary morning in West Sussex. What wonderful memories it brings back, particularly on Mr. and Mrs. Ross (Johnnie Leekey). They lived at 38 Gordon Terrace, and I lived at 32, next to the Macaigs at No 30. All of the Ross family were so good to me all the way through my school years, but I am sad to say I let Mr. Ross down, being particularly useless at Latin in my first year at secondary school. We were the first intake into the new Academy, and it was so grand compared to the old site on the High Street. Mr. Milton, Ma and Pa Conon, Mr. Preston, Mr. Taylor, Mr. and Mrs. Shearer all played their part in my education. Like many others, I have very fond memories of the school and its teachers and my classmates, particularly the gang of children who used to play “Cheeky Nelly” and “Kick the Cannie” in Gordon Terrace: Kate, James and Bobby Macaig, Robert McKay, Gordon Sutherland, Margaret and Evelyn Westphal, Florence, John and Susan Urghuart, Donald and Ross Urghuart, who used to walk up and down the street with his tin drum for hours on end. Happy, happy days, with lots of freedom to have fun. Just on Gordon Terrace, in the early days when it was the only completed Road “up Snob Hill”, virtually everyone had a “rustic” fence around their front gardens. “Rustic”, because the fences were all made from young birch trees from the wood at the back of the Terrace. On a Saturday the field between the wood and Gordon Terrace was full of people dragging freshly felled saplings up to their home to construct fences. No-one ever seemed to object to this plunder! By the way, Sue, I too live in West Sussex, much much drier than Inverg ever was! Hi Sue, I was interested to see that like myself you also live in West Sussex. Since living in England I have never met anyone from north of Inverness. This is a wonderful site and as you say full of wonderful memories. You are probably younger than me as you went to the new Academy. Hi Sue, I too went to the new academy, quite a difference to the old, we had the boys stairs and the girls stairs and Mr Fleming the janitor guarding the stairs……Pa Conon shouting in that inimitable voice “walk don’t run”……Not so much opportunity to skive off either between classes! Bill, you are so right about the fences, as we all had one round the front garden. You have a wonderful memory for detail. Do let me know where you are in West Sussex, and Janet, perhaps we could all meet up for a blether? Liz, I can remember the new academy so well, but I loved my time at the old one, with Miss Crystal and Mrs. Duff, odd fellows on a Friday afternoon just at going home time. I cannot remember Mr. Fleming though, he must not have been as scary as the one at the old school? When I returned to Invergordon after years in the RAF and time in the distillery, I was the lab technician in the new academy. I left there to join British Aluminium as a chemistry analyst. Susan, you must be referring to Mr Clark (the Jake) - there was none like him. Such a pleasant individual, uhhum. I was there during the early '70s. Does anyone remember Donny Pongo, the English teacher, Ma Pirie the scary maths teacher and Miss Wilkie the french teacher? Anyone remember the name of the chemistry teacher, who also delivered the milk to Cadboll Wood?! See picture #540 for Ma Pirie (Jessica) and her sister. Not sure who delivered milk to Cadboll Wood, possibly Denis Slattery? ... the contributor of the photograph above and many more photos on this site. Sorry Kenny I never delivered milk. I know that my grandfather was a milkman but that was early 1900s in West Calder and from 1922 to his retirement in Armadale, west Lothian. I didn't really think it would have been you Denis, I was racking my brains trying to remember names of chemistry teachers from the 70s...there was a chemistry teacher living at the top of Bermuda Road who drove around with his golden labrador sitting upright in the passenger seat - cannot recall his name though! Jackie Hall was more physics - and I couldn't imagine him driving a milk float!! I was in Mr Slattery's class in the 3rd year, then The Milkman's in the 4th. I think his first name could have been Roger... Definitely not Mr Hall, I was in his physics class. Can't remember if Mr. Taylor taught some chemistry as well. Solved - it was Mr Baxter. Thank you! That will be Robert Baxter OBE ... Awarded 2014 for voluntary services work both in Scotland and overseas. Richly deserved along with his wife Jan who was also awarded the OBE. Maybe it all started delivering the milk. Yes indeed Tommy, know where you are coming from. There was a few others like that teaching at Inver-g Academy, I know I ran into a few. Kids were supposed to be taught not humiliated. You could never question any of them. They did more harm than good. I hope it is not that way today. Maybe I was just a scaredy cat, but I have so many happy memories of school, and know now that I could have got so much more out if it. I took my BA (Hons) degree in my forty's, and loved every minute. When I got my 1st in an essay, I was so chuffed. Invergordon Academy did me proud.